I am fully aware that my enchilada obsession is nearly out-of-control right now. I just can’t stop making homemade sauce. And I can’t stop thinking of ways to use it, other than the obvious. So let me tell you how this enchilada burger came to be. When Noshon.it first started talking about #BurgerWeek, I actually had a meatloaf burger in mind.. I adore a good meatloaf but my meatloaf recipe really is nothing special so I felt kind of “meh” about turning it into a burger. And then a couple of weeks ago, under the trance of finding out I, in fact, love enchiladas, I made enchilada pasta. And then the leftovers were gone too quickly and I was craving more. So I bought more of the ingredients with intentions to make more pasta, but then I remembered I still needed a burger recipe for this week. And there was the lightbulb. Enchilada sauce + ground beef + some seasonings, cheese & avocado = my new summer obsession. A few tips: don’t cook these burgers for a first date – they are messy; if you plan on feeding them to kids you might play around with the spices – these definitely have a kick; however, if you need more of a kick, use some pepper jack cheese! 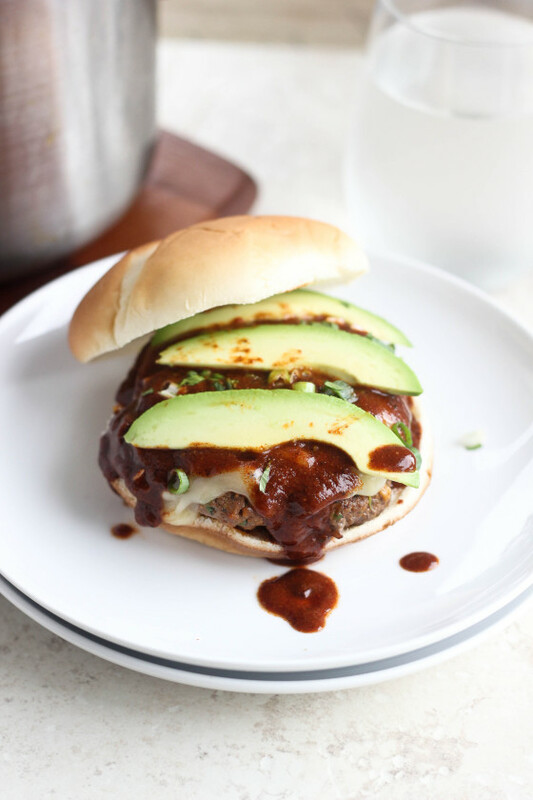 Mexican food-inspired sloppy burgers with homemade enchilada sauce, green chiles, and ground beef, and topped with cheese, cilantro, green onions and fresh avocado...you won't even miss the tortilas! Mix the ground sirloin, green chiles, green onions, cilantro and spices together until mixed. Add the enchilada sauce and stir until distributed. Add 1/4 cup of panko and mix in (I used my hands), and add additional panko until the mixture is a consistency where it holds together. Divide the mixture evenly to create four patties. Heat a large non-stick skillet over medium heat. Add 1-2 teaspoons (not too much!) oil. Place the burger patties in the skillet and cook for 5-6 minutes, until browned. Flip and cook on the second side until the burger is cooked to your desired doneness. I did about 4 additional minutes. Top each patty with cheese and loosely cover the pan until the cheese is melted. 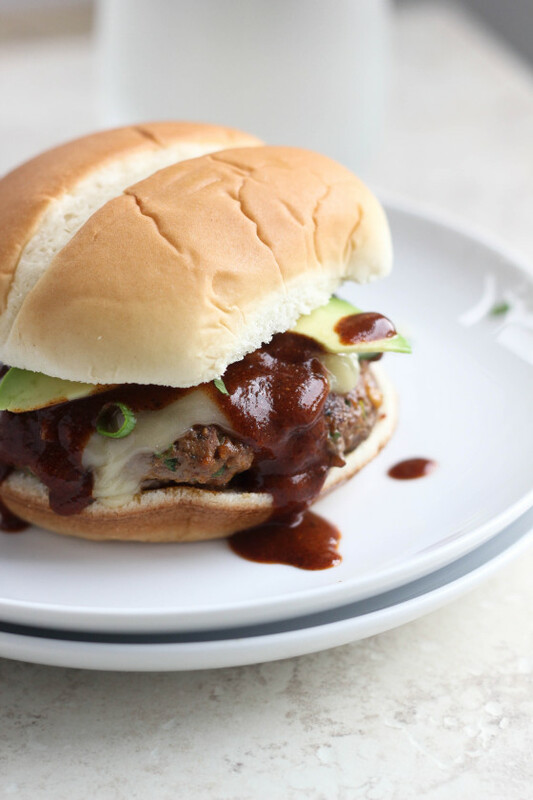 Serve the cooked patties on the buns and top with extra enchilada sauce, avocado slices and additional cilantro & green onions as desired. 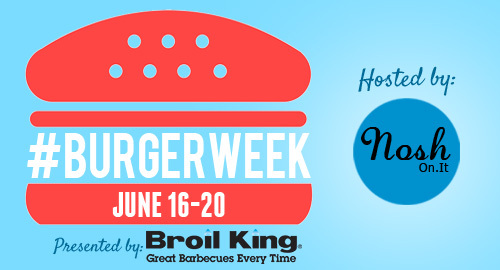 And for a full listing of this week’s burger-mania, check out the #BurgerWeek landing page at NoshOn.It. I’m making enchiladas for dinner tonight, but now I totally want them in burger form instead! These look delicious. Isn’t homemade enchilada sauce a game changer?? These look amazing! Seriously Cassie, you’re a genius! I want this for dinner tonight!!! HOLY DELICIOUSNESS!!! Ahhh I have never made my own enchilada sauce!!! I know I need to! What an awesome twist on burgers! Love it! The enchilada sauce drip – epic!! Oh, I think this is totally obvious. Obviously needs to be in my belly. Duh. You made the right call. That sauce dripping! I want. You are singing my tune with these! Love enchiladas. Genius to turn them into burgers! While I definitely think a meatloaf burger would have been great, enchiladas have my heart so I love love love these! What a great idea for a burger! Love the enchilada flavors! Well you’re freaking brilliant for turning one of the best mexican dishes into a burger. Cassie! You little devil, you. I will be dreaming of these all night!!! 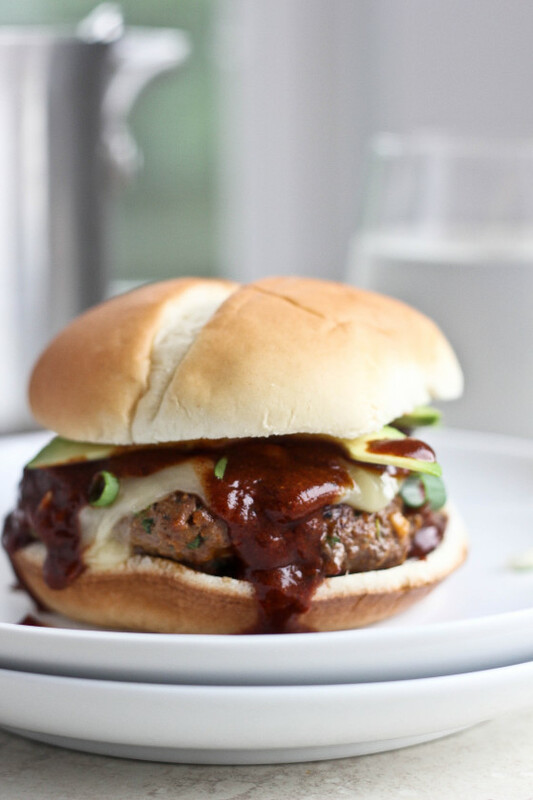 Enchilada burgers… brilliant!!! Tex Mex flavors always always always hit the spot for me! Definitely need to make some kind of enchilada burger for the summer. These are so inspiring! WOW! these burgers sound so good! I love enchiladas and I can’t wait to try this recipe! Two of my favorite things in one! Love this burger! Oh, I do so love red enchilada sauce. Simply cannot wait to make these fab burgers. Great recipe! These are going to become a recurring thing in my dreams, I think…woww. oh my gosh, this is perfection! What a fun flavor combo!